Camel Spider Photo and Video: Giant Camel Spiders in Iraq (FREAKY!) : Watch giant camel spiders in the iraqi desert : AwfulGames -- Awesome Online Games, Awful Humor and Really Fun Stuff. Despite the Name, No Awful Games! 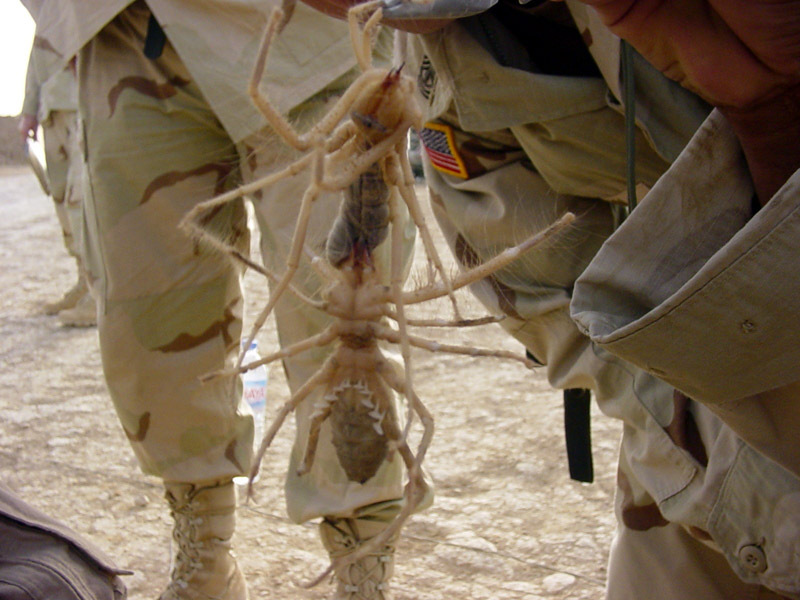 The photo below of giant Iraqi camel spiders reportedly comes from a soldier, stationed in the desert near Baghdad, Iraq, who was bitten by a giant camel spider that was hiding in his sleeping bag. Fortunately, the giant desert camel spiders in Iraq aren't venomous... (they're not really even giant spiders at all) but they're BIG and FAST (giant camel spiders can run around 10MPH, as shown in the video below the photo). The photo shows two giant Iraqi desert camel spiders attached together, and the camera angle makes the giant spiders look a tad larger than they really are (giant camel spiders from the Iraq desert are about the size of an adult's hand). They also tend to seek out shade during the daytime, so it's not terribly unusual to see giant spiders charging across the Iraqi desert at you -- only to come to a screeching halt when they reach your shadow. Below the photo is a video of the camel spider in action.